Surgery for urinary incontinence or other bladder-related problems may be considered if conservative strategies have been unsuccessful. Surgery for urinary incontinence or other bladder-related problems (e.g. Overactive bladder without leakage) may be considered if conservative strategies have been unsuccessful – see section on BLADDER PROBLEMS/URINARY INCONTINENCE. It is important that risks, benefits and alternatives to surgery are fully understood. Both you and your gynaecologist need to feel assured that all relevant issues have been explored before proceeding with surgery. Cystoscopy is a diagnostic procedure where a telescope (cystoscope) is inserted into the bladder to look for possible causes to explain troublesome bladder symptoms. If required, a bladder biopsy and certain treatments can be performed at the same time. Colposuspension is a major procedure performed less commonly for stress urinary incontinence and can be undertaken through the laparoscopic (‘key-hole’) or laparotomy (larger incision in the abdomen) route. This will be determined by surgeon experience and patient preference. This is a surgical treatment for stress urinary incontinence i.e. urinary leakage with coughing, sneezing, effort and/or exertion. The operation involves placing a piece of synthetic mesh material, like a sling, under your urethra to support it. The ‘cure’ rate is in the region of 80-90%. Note: The mesh material is made of a non-absorbable material and is intended to be a permanent implant. The main intended benefit of the tape procedure is to cure or improve stress urinary incontinence. Published studies have shown similar or better success results in curing or improving stress urinary incontinence to those gained by more traditional non-tape surgical procedures. The procedure is not intended to improve symptoms of an overactive bladder (urinary frequency, urgency, urgency incontinence or waking up at night to pass urine). This is a different condition that sometimes may improve following this type of surgery and sometimes may worsen. Success Rate Better evidence of long – term success rates Similar success rate in the short and medium-term. Long term data (5 years and beyond) are awaited*. This procedure involves injection of a bulking agent into the urethra to add volume to the tissue. This supports the closing mechanism of the urethra and provides better control of urine when you cough, laugh, sneeze, exert yourself or change position. These complications are temporary and should resolve within a few days/weeks. The procedure is carried out under general anaesthesia as a day case procedure and usually takes 15-20 minutes to perform. Patients go home the same day and should be able to return to normal activities within 24-48 hours. If the effect of the bulking agent is insufficient following the first injection, a ‘top-up’ injection may be considered to try and achieve better symptom control. Botulinum neurotoxin is used for a variety of therapeutic indications. This agent is now gaining popularity for treatment of otherwise healthy patients with overactive bladder syndrome (OAB). OAB is characterised by urinary urgency (with or without leakage), often accompanied by passing urine frequently during the day and/or night. Other possible causes e.g. urinary tract infection, need to have been excluded. If conservative measures to improve OAB have been unsuccessful, then you may be offered Botox treatment to the bladder. This is a minimally invasive procedure, usually taking about 30 minutes to perform. 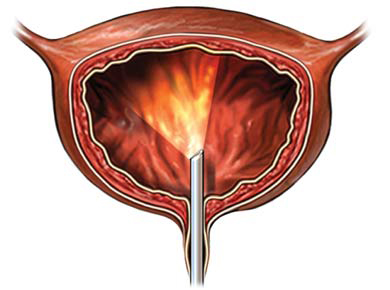 It involves injecting Botox into the bladder wall via a camera called a cystoscope (see section on CYSTOSCOPY). You will usually go home the same day and return to normal activities within 24 hours of the procedure. The benefits of bladder botox usually last 6-9 months or longer. Repeat courses may be offered depending on your symptoms. What are the risks of Bladder Botox treatment? You may see some blood in the urine initially after the procedure. Significant bleeding is extremely rare. Urinary tract infection is reported in about 1 in 12 cases but this can be easily treated with antibiotics. 3 to 10% of patients may require temporary self-catheterisation to help the bladder empty.